Inviso delivers interactive dashboards, custom reports, user-friendly tools, industry-leading experience, and hands-on training so you can make smarter, faster decisions to drive better business. From free readiness assessments to workshops to proof of concepts to full implementation, Inviso can help bring your data to life. Getting Started with Power BI – This offering is designed to show you how you can visualize and share data across your organization with ease. After a guided tour of your data sources, security, licensing, infrastructure, and any existing reporting, our experts will help create a road map for designing, developing, deploying, and maintaining your Power BI environment. This offering can be completed remotely or on-site. Migration Assessment – This offering is designed to give you a cost/benefit analysis of migrating from a competitor/legacy platform to Power BI. We will review your existing BI assets on either competitor platforms such as Tableau, Qlik, etc. or legacy Microsoft platforms such as Excel, SSRS, etc. to identify opportunities for improvement or simplification, potential feature gaps or work-arounds, and a price comparison. This offering can be completed remotely or on-site. Best Practices Assessment – This offering is designed to give you expert recommendations on Power BI implementation and optimizations for performance, scalability, security, usability, aesthetics, and more. We’ll also provide documentation of our findings, recommend next steps, and help estimate the amount of time and effort needed to achieve your Power BI goals. This offering can be completed remotely or on-site. Power BI Jumpstart – This is a hands-on, three-day workshop to help you adopt Microsoft Power BI for self-service business intelligence. Our experts work side-by-side with your analytics/BI team to take an existing, high-value report and convert it to Power BI as a vehicle for training your team how to create Power BI reports and dashboards. We use your organization’s real data, so you can learn Power BI best practices in a context that’s unique to your business. This offer is designed specifically for do-it-yourself teams that want secure, self-service Power BI for their organization. Workshops can be held virtually or on-site. Dashboard in a Day – Power BI dashboards provide a 360-degree view of your business data. This immersive, one-day, hands-on session is designed to guide you through the entire lifecycle of a Power BI report. You’ll learn how to connect to data, shape it to meet your requirements, build visually stunning reports and dashboards, and publish to the Power BI service. You will also learn how to securely share your creations inside your organization, including sharing to mobile devices. At the end of the session, we’ll help you take what you’ve learned and start building reports and dashboards with your own data. Workshops can be held virtually or on-site. 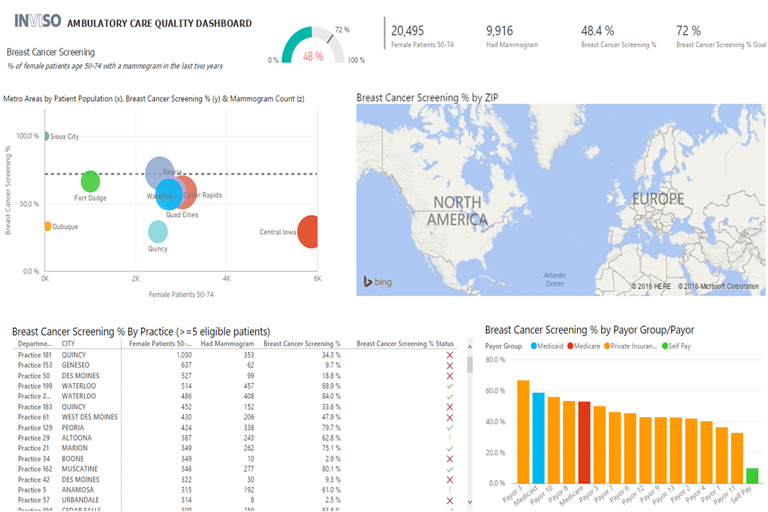 Power BI Proof of Concept – The Power BI Proof of Concept is designed for organizations looking to understand Power BI’s functionality and ROI, quickly create a tangible report to circulate internally to demonstrate feasibility, or just see how Power BI can unlock actionable insights from your data. This offering can be completed remotely and no licensing is required. Power BI Implementation – Skip the learning curve, and utilize the full scope of Inviso’s Power BI capabilities. This offering is designed for customers who want a trusted partner throughout all phases of the Power BI lifecycle who can provide world class reporting and deliver results in days instead of months. Let us design, build, and deploy your solution with our dedicated team of experts. We’ll deliver an optimized solution to acquire, shape, relate, visualize, and – most importantly – utilize and share your data with ease. This offering can be completed remotely. To learn more about these offerings, pre-requisites, and cost, please contact info@invisocorp.com.